Helping women across their life span eliminate tobacco and secondhand smoke exposure are the burning issues addressed in this smoking cessation counseling training video. 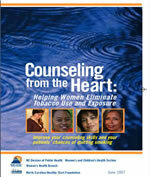 Counselors effectively model evidence-based counseling techniques using the 5A's (Ask, Advise, Assess, Assist and Arrange Follow-up) to assist patients engaged in varying stages of tobacco use. Two contrasting styles of smoking cessation counseling demonstrate how effective counseling can be achieved by using reflective listening and by incorporating the "Stages of Behavior Change" framework. The patients featured in the video represent a range of ethnic and racial backgrounds, as do the counselors and narrators. Infant Safe Sleep Resources - North Carolina presentation at Carolinas Medical Center, Charlotte, NC (Sept., 2007). North Carolina Tobacco Use Quit Line - provides free one-on-one support that can make all the difference when trying to quit smoking. NC Prevention Partners - a statewide non-profit, membership organization dedicated to building effective prevention systems in NC communities and health systems in order to improve health of all North Carolinians. Healthy Hospital Initiative - Comprehensive resources for hospitals going tobacco-free. Updated listing of tobacco-free hospitals.